The current version has not been tested on Mac (as we have no machines for testing), so please report to me if it runs (or not) and what VM you used. See the Bioclipse website and Bioclipse Wiki for more information about the project. 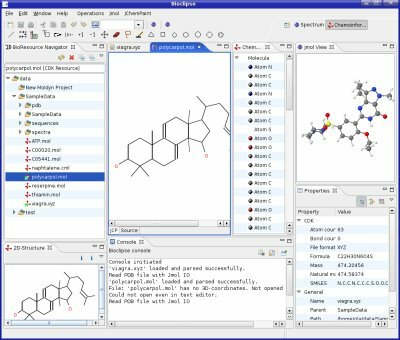 Today, Bioclipse v. 0.8.0 was released. Unfortunately it is only available for linux (gtk, x86) due to problems with the latest Eclipse version. We hope to have a Windows version out soon. The new version is fully functional but is in no way to consider stable. Nevertheless it has all basic functionality such as molecular browsing, 2D-editing (using JchemPaint), 3D-visualization (using Jmol), spectrum analysis and visualization, CML-support and much more. See the Bioclipse Wiki for more information and tutorials. The release is available from Sourceforge.